UK gas prices remain elevated and subject to further volatility as cold weather continues into the spring. One of the key factors in focus is gas storage levels, with UK reserves now below 5% of capacity and continental storage balances at historical lows. It is interesting to analyse how European storage has responded through the recent period of higher prices. As the UK gas market tightened in early March, the NBP premium to continental hub prices rose, incentivising the flow of gas across the interconnectors (IUK and BBL) and withdrawal out of UK storage. As the UK deliverability issues became more acute with major Norwegian supply disruptions, continental hub prices spiked along with NBP providing a strong incentive for continental storage capacity withdrawal and maximised contract lift. Sustained cold weather, continued infrastructure issues and increasingly low storage levels kept hub prices high enough to attract flexible LNG cargoes from Qatar & Trinidad, alleviating the supply pressure. The UK system remains tight at least until the current cold snap subsides, but this pattern of response provides strong evidence of a well-functioning pan European gas market. 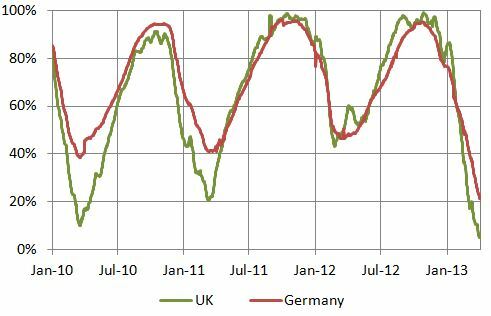 Chart 1 shows a comparison of the inventory profile over the last 4 winters for German and UK storage capacity. Before this winter, German minimum winter inventory positions have been quite stable at around 40-45% of capacity. This reflects the fact that security of supply, physical portfolio balancing and risk management requirements have been strong drivers of German storage capacity utilisation. The story is similar for France, the other major source of seasonal storage capacity in North West Europe, where there are regulatory mandated minimum inventory levels. It is interesting to note the significant decline in German storage inventories over the current winter to historical lows. This is evidence of the fact that strong price signals, in this case driven by the UK NBP, have incentivised the withdrawal of gas that has not been accessed previously. In other words, the UK has effectively been utilising European storage balances to alleviate supply tightness during March 2013. It also reflects a more commercial attitude that continental capacity owners are taking to the optimisation of storage capacity. 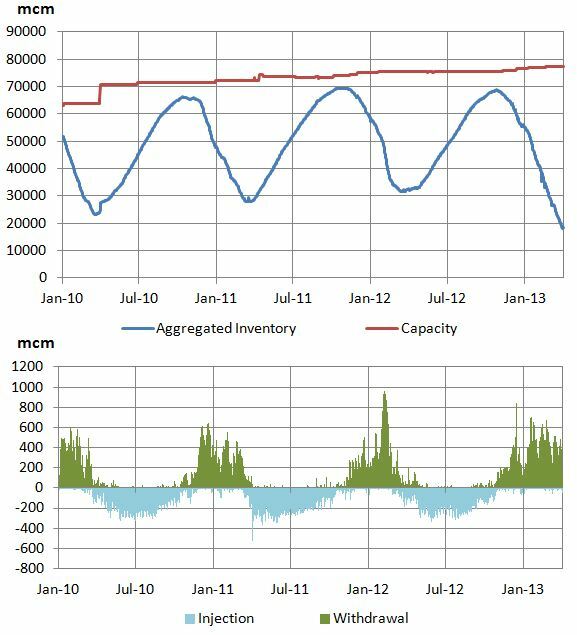 Chart 2 provides an aggregate European view of historical storage inventory levels and the injection/withdrawal profiles. The chart illustrates that aggregate European inventories are also well below historical average. The impact of a more prolonged period of supply tightness and sharper price signals is clear in the large Q1 withdrawal volumes in 2013. This can be contrasted with the February 2012 cold snap which also caused a spike in hub prices. The Feb 12 spike produced a larger absolute withdrawals but had a negligible impact on overall inventory levels as it was the result of a relatively short and sharp period of cold weather rather than the persistent supply disruptions of Mar 2013. The UK may face another week or two of supply tightness if a continuation of cold weather starts to overlap with maintenance related supply curtailment. But forward gas prices indicate that conditions will soon return to normal. Importantly though, low storage inventory levels across Europe should provide support for summer prices as stocks are replenished (although the impact of this will already be reflected in forward prices). Alleviation of the pressure on prices will hopefully lead to a period of more considered reflection of the issues that have caused the recent UK price volatility and an appropriate response. Debate in the UK has been focused around whether there are adequate levels of UK seasonal storage capacity to ensure security of supply. But focusing on the UK in isolation ignores the substantial reserves of European supply flexibility that the UK can access. The evidence above points to a well functioning market response over an unusual period of system stress.